Congratulations to the 2017 Recipients of the ISTAT Scholarship and Grants Program! Additive Manufacturing is Becoming Increasingly Popular with Manufacturers across a Swath of Industries; is it Ready to Fly? Complementing another fabulous — though at-times sweltering — Paris Air Show, ISTAT once again hosted a lavish reception and offered an onsite chalet for members and guests throughout the duration of the air show, as well. Members and invited guests gathered at the Palais Brongniart in Paris at the conclusion of the air show's first full day on 19 June to network, catch up with colleagues and forge new relationships, all while enjoying the scenery provided by this historic and awe-inspiring location, a former 19th century stock exchange. Onsite at the air show, more than 1,000 attendees took advantage of the air conditioning, outdoor shade and welcoming atmosphere at the ISTAT Chalet to enjoy food and beverage, network, conduct business and a front row view of the air show. Although temperatures in Paris soared to more than 37o C that week, the chalet provided a cool refuge for members and guests. Click here for photos from the reception and chalet, and here for photos from the charity day. Complimentary conference/forum admission has not been granted within the previous 12 months. A minimum ISTAT membership of five or more consecutive years. Requirements may be waived/changed at the discretion of the Executive Committee. For eligibility requests, please contact Julie Wichlin at executivedirector@istat.org. For those attending EAA Air Venure Oshkosh, ISTAT member Fortress Transportation and Infrastructure will be hosting a complimentary reception for ISTAT members at the Boeing Chalet in Boeing Plaza on 26 July from 5:30-8:00 p.m. Food and drinks will be served, and a B787 simulator will be free for all to try. Patty Wagstaff and other airshow pilots will make appearances during the reception. For additional details, please contact jlewis@fortress.com. ISTAT EMEA offers countless opportunities to network and create new, lasting business connections. Nearly 2,000 delegates are projected to attend this year's event, which will again feature keynote presentations, panel discussions and much more. The two official hotels for the event are currently sold out; however we do anticipate some rooms becoming available in the coming weeks, and you may be added to a waitlist. Click here for more, including a list of hotels near the Edinburgh International Conference Centre that currently have rooms available. Save the date for the next ISTAT Latin America Forum. This year's event takes place 15-16 November at the Hilton Bogotá. Registration will open in August. ISTAT will once again be hosting a reception at the Dubai Airshow, this year at the Grosvenor House Hotel Dubai. Registration is available to members and guests and will open in August. The Foundation recently awarded 42 scholarships to aviation-focused students worldwide totaling $351,051 and 16 grants totaling $77,500 to non-profit organizations that promote the advancement of commercial aviation. 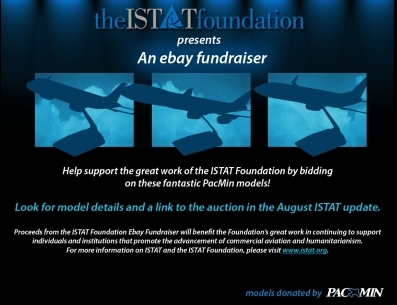 Visit www.istat.org/scholarships and www.istat.org/grants to view the list of recipients. Check out this month’s #ISTATGivesBack with Yreka Flores featuring 2016 ISTAT Scholarship Recipient, Emily Linenkugel: www.istat.org/istatgivesback. Tune in to learn more about her experience in receiving an ISTAT Scholarship and attending the ISTAT Americas conference. Applications for the 2017 ISTAT U 2.0 program (distance-learning) are now available to qualified students at universities around the world. ISTAT U is a specially designed one-year (six credit hour or global equivalent) aviation finance and leasing program. Admission requirements and application instructions are available at www.istat.org/istatu. The deadline for students to apply for enrollment is Friday, 29 September 2017. The Foundation is actively accepting applications for 2017 humanitarian grants. Learn more about the Humanitarian Program and the application requirements at www.istat.org/humanitarian. Advertising space is now available in the Autumn issue of Jetrader magazine. Beyond our normal distribution to all ISTAT members in both print and interactive digital editions, this issue will have significant bonus distribution at ISTAT EMEA event this September. For year-round access to ISTAT members, please reference the advertising opportunities available through ISTAT and Jetrader by clicking here, or by contacting: Erik Henson, Jetrader media director at +1 352-333-3443 or ehenson@jetrader.org. We are now accepting article submissions for the autumn 2017 issue. If you are interested in sharing your expertise and contributing to the content of Jetrader, please contact ISTAT at istat@istat.org. The International Air Transport Association (IATA) announced global passenger traffic results for May showing that demand (measured in revenue passenger kilometers, or RPKs) rose 7.7% compared to the same month in 2016. This was slower than the 10.9% growth recorded in April. However, this still was well ahead of the 5- and 10-year average growth rates. Capacity climbed 6.1%, and load factor rose 1.2 percentage points to 80.1%, which was a record high for the month. Boeing and Airbus delivered 75 and 64 commercial jets in June 2017, respectively, compared to 74 and 64 during the same month last year. This year to date, Boeing has delivered 352 jets (375 by this time last year), while Airbus has delivered 306 (298 in 2016). The Indian government's plan to privatize the struggling flag carrier Air India could help the country's aviation sector to soar. A group of ministers has been tasked with determining the finer details of the process, after India's cabinet recently approved the privatization of loss-making Air India "in principle."